The N-VivoTM Spine Bone Densitometry Application provides phantom calibrated, advanced 3-D reformatting capability with proven automated ROI placement and image processing. Only N-VivoTM QCT systems apply automated software ROI placement for high accuracy and precision, ease of use and high patient throughput. The exceptional ease of use with software generated ROI placement and easy slice location tools reduce errors, analysis time and report generation. CT localization scans can reveal the presence of lumbar scoliosis, vertebral fracture or deformities and other anatomical features that often result in BMD errors. 3D volume analysis allows selection of valid measurement sites to avoid ossifications that that could falsely elevate BMD results. With our product, demographic and scan parameters are automatically read from the DICOM header and presented on the patient report; no data entry is required. 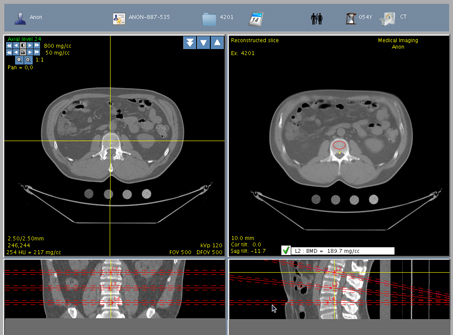 Like all Image Analysis Applications, ROI placement is mathematically derived and automatically positioned by the software, in both the phantom samples and patient's anatomy of interest. This highly automated software provides highly consistent results and ease of use. Valuable CT facility time is saved, while reducing inter-operator variation in results. ​Spine BMD analysis may be conveniently included in almost any abdomen scan or torso CT screening procedure for other diagnostic purposes. Placement of the calibration phantom under the patient in the scan field permits volume series to be transferred to our software for thoracic or lumbar spine BMD analysis without compromise of the primary imaging procedure. See the Calibration Phantoms tab for a description of the new INTableTM Calibration Pad.